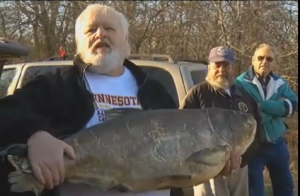 Giant, flying fish may soon be a potential danger in the Minnesota River. Asian Carp have been present in the Missouri River system for some time, but during the floods in 2011 they made their way to lakes and streams in southwestern Minnesota. To someone who doesn’t know much about fishing, the giant fish can look like a pretty nice catch, but Asian carp and its relatives are worse for fisherman than a tangled line. Rick Carlson with the MN Asian Carp Coalition and New Ulm Sport Fishermen says Asian carp, including the infamous ‘flying carp,’ are dangerous to boaters and other water recreation activities, and can take over entire aquatic ecosystems. The Minnesota DNR has been focusing on the Missouri River to keep the fish out of the state for a while now, but they fear the fish might have found a back door. Those waters connect with lakes and streams in southwestern Minnesota, so the Minnesota DNR is pitching in almost $300,000 to build an electronic barrier, similar at the base of the great lakes watershed. Carlson says while construction of barriers like this are a step in the right direction, he would like to see more work done closer to the source of where the fish are coming from so they don’t even have a chance to infest other waters. Which means the fate of Minnesota waterways depends on more than just Minnesotans.